Children's books can be so fun, and I like having the chance to read and review them. 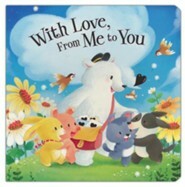 I love sharing new books with my nieces and nephews so I was happy to check out With Love, From Me to You. This book shares a simple message about what it means for a person to show love to others. The pictures in this book are colorful and fun. This is a good book for babies through young school-aged children. This book encourages children to be loving. The pictures in this book are cute and colorful and fun. The way that this book is written makes it enjoyable to read and listen to. This book is a little random but I still thought it was fun. Overall, I think this is an okay kids' book. I give With Love, From Me to You 4 out of 5 stars.